The Sawgrass Marriott in Ponte Vedra is one of the premier hotels in the area, a destination stay, especially during The Players Championships. Not only do they offer top notch lodging, but also high end dining, entertaining, and conference spaces. I was invited out to their annual VIP Private Reception during TPC Weekend. 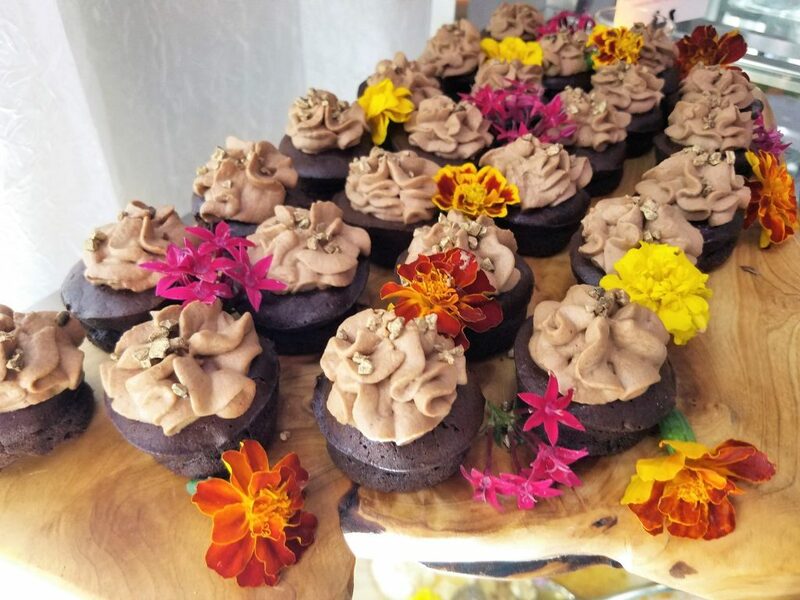 This private reception is put on by Sawgrass Marriott’s talented culinary and mixology team headed by Executive Chef Joe Natoli and Senior Restaurant Manager, Robin Michelle Jones. 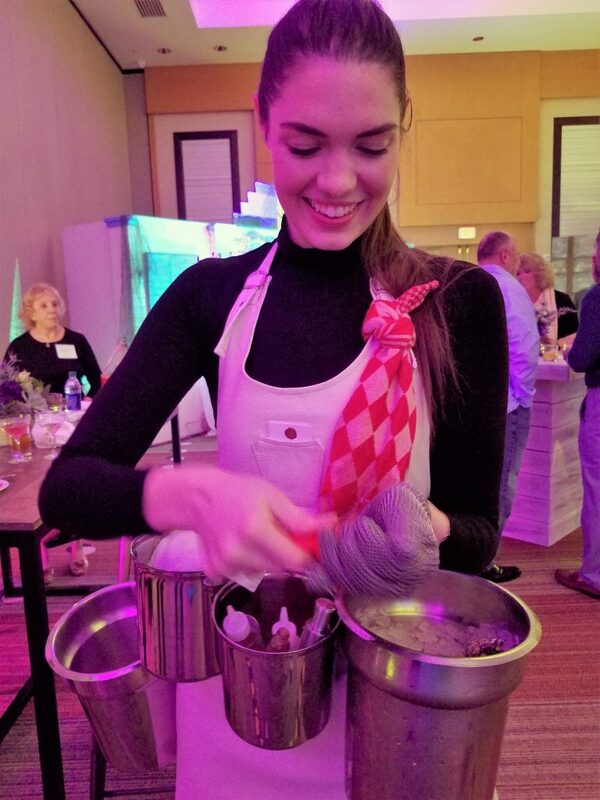 This event allows their entire team to showcase and show off what they can do and what the Sawgrass Marriott’s event space is capable of. It was held in the Champions Ballroom in the Convention Center next to the hotel. The main ballroom had five distinct spaces within them, each with their own theme. After walking through a hallway decorated with hydroponic garden towers you emerge in the foyer section. It was set up with a large screen displaying a slideshow of Sawgrass Marriott’s on-site beekeeping facility and gardens. The honey and vegetables grown in the gardens are used in Sawgrass Marriott’s own fine dining restaurant, Vernon’s. Walking into the main ballroom, there was a live DJ and dance floor, open bars, and food stations. 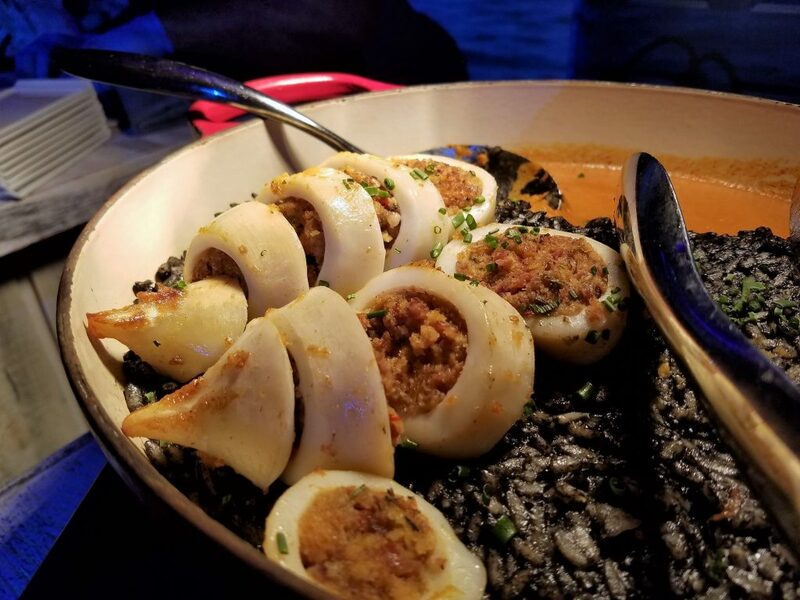 In the main ballroom, there was a seafood station featuring stuffed squid with squid ink risotto, ceviche, shrimp, etc. The ceviche was particularly delicious and fresh. Next to the fish station was the meat station. And it was by far my favorite area. 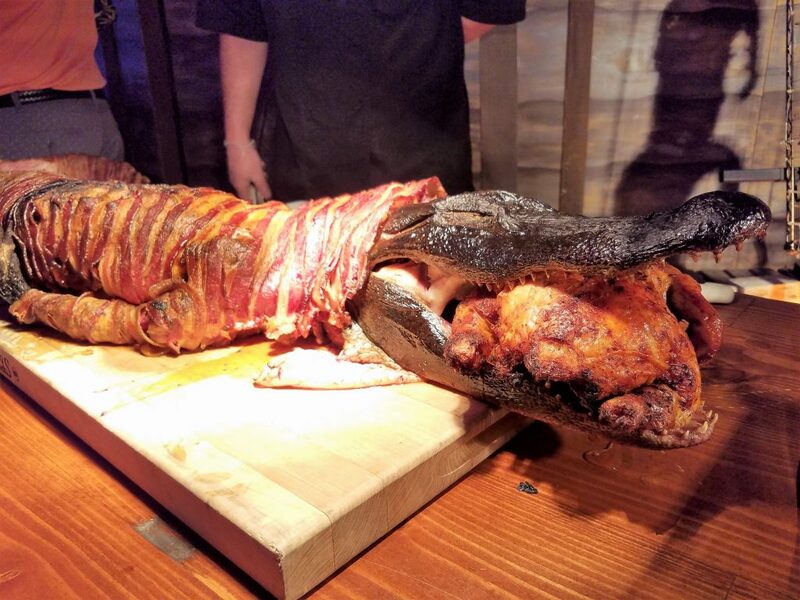 The Pièce De Résistance was easily the whole smoked, bacon wrapped alligator, featuring the whole animal from snout to tail. And just for kicks and giggles, a whole roasted chicken rested between its jaws. I sampled some smoked gator tail, roasted chicken, roasted vegetables, whole roasted pig, and corned beef carved from what appeared to be a boulder masquerading as a tender and perfectly cooked side of beef. All top notch presentations and tasted amazing. 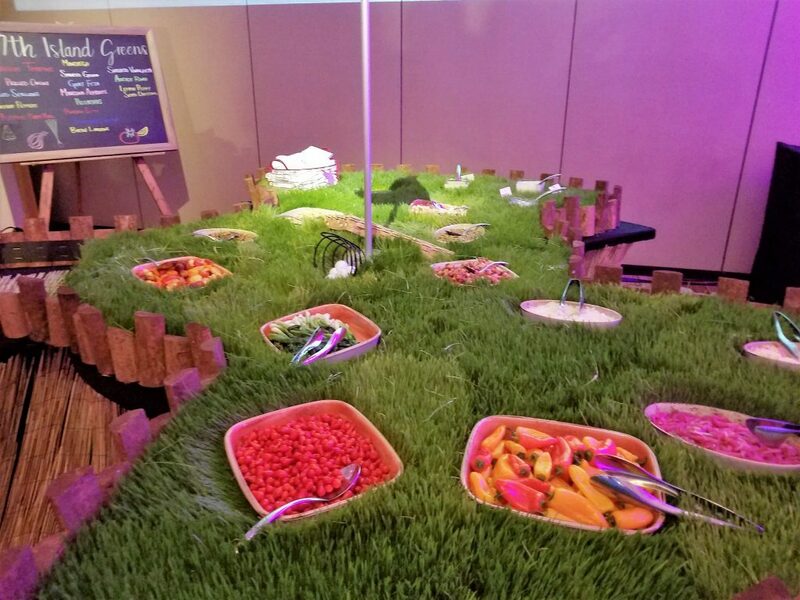 Beyond the meat stations was the “17th Island Salad Bar.” a fairway filled with various salad greens, accoutrements, and dressings. Beyond the various stations, there were mobile oyster bars working the floor. It was a unique way to present a raw oyster bar. Photogenic young ladies walked around the floor and strapped to them was everything you needed for an oyster bar. On one hip was a bucket of ice and oysters. On the other hip, an empty bucket to discard the oyster shells. And in between both buckets, a variety of sauces with which to top your freshly shucked oyster. It was like Batman’s utility belt if Batman were a foodie instead of a crime fighting vigilante. In the middle of the main ballroom was a “speakeasy,” a couple of open bar stations and a “hidden” area behind the bar that featured a small mixology station and decorated with 1920’s style memorabilia. There were two internal rooms within the main ballroom separated by movable walls. One room was dubbed the “Meat Market” and was a build-your-own charcuterie plate featuring cheeses and meats from all over the world. I piled my plate high with chunks of Parmigiano reggiano, iberico cheese, prosciutto, coppa picante, and creamy brie. So much meat and cheese, so little time. . .
Dessert was located in the “Champagne Room,” the second of the internal rooms within the main ballroom. The room was decked out in all-white décor. 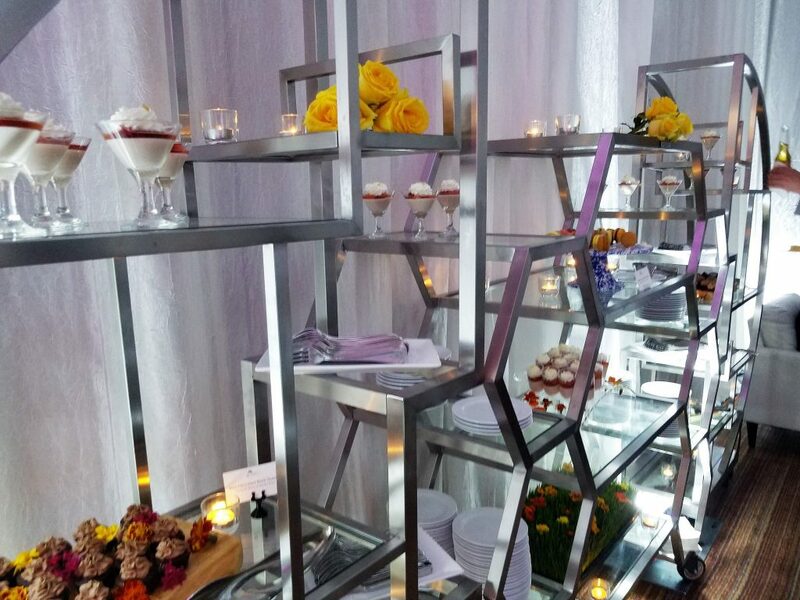 The dessert racks were impressive, filled with macarons, miniature cakes, push pop gelees, and martini glass mousses. 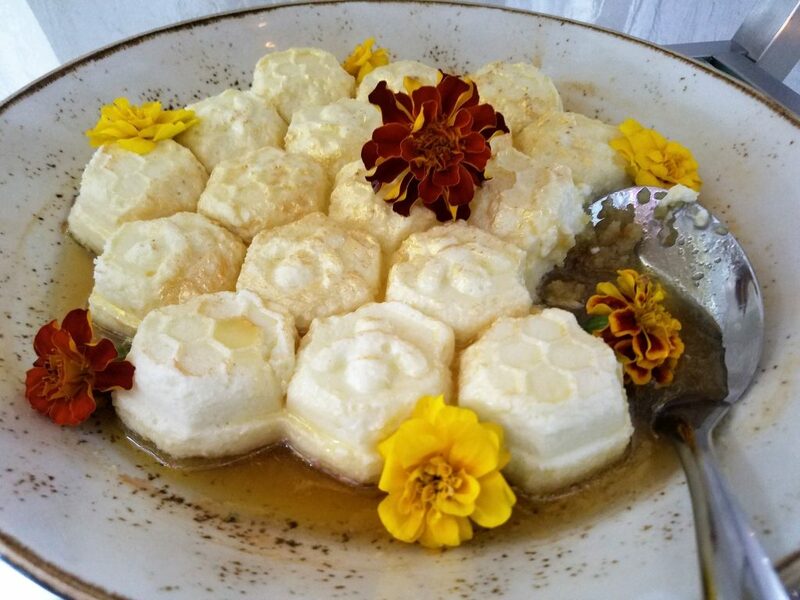 My favorite dessert was the whipped cheesecake mousse with honey harvested from the on-site beekeeping farm. It was light, rich, and honey forward. However, it wasn’t all desserts and it wasn’t called the “Champagne Room” for nothing. On the opposite wall from the desserts was a champagne wall and station attended to by another group of Instagram ready young ladies dressed to impress and ready to serve you enough champagne to make it feel like it’s New Years Eve again. It was a wonderful event and showed me the Sawgrass Marriott is capable of handling any special event large or small. With the movable walls, the Champions Ballroom can be configured in a number of different ways. They also offer other ballrooms of varying sizes to fit your event. If you’re looking to throw an outdoor shindig, the Sawgrass Marriott grounds offer the perfect space. The kitchen staff can handle whatever food items you’ll need to keep you and your guests well fed. The hospitality staff is professional and the level of service provided will make your party feel as if it’s the only party in town. The next time you’re planning your corporate meeting or event, give the Sawgrass Marriott a call at 904-285-7777 or visit their event planning page by clicking here. Tagged corporate events, Dinner, event space, events, hotel, special event. Bookmark the permalink.